Andy Siedler has donated over 100 pints of blood and wants others to know how easy it is to donate. CHICAGO -- Donating blood can save three lives. Andy Seidler, a long-time blood donor, has helped countless people. In fact, he hit a milestone after donating more than 100 pints of blood. "For me its routine now, I almost feel guilty if I don't go to the day on my next donation time frame, Seidler said. 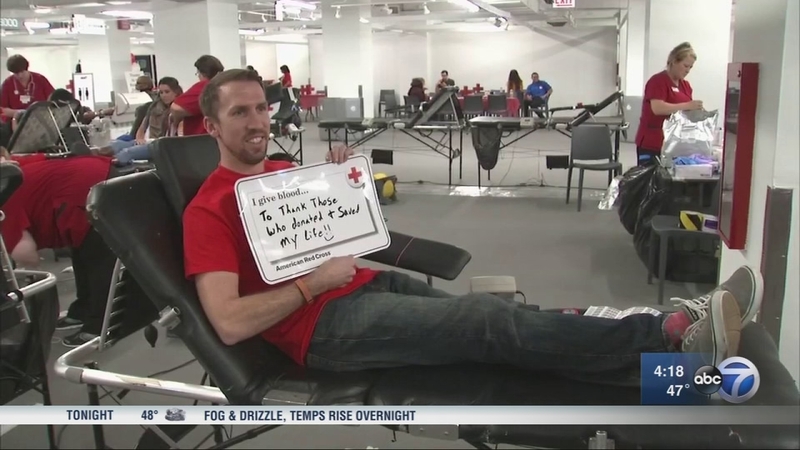 ABC 7 Chicago and the American Red Cross team up for the 4th Annual Great Chicago Blood Drive, Wednesday, January 10, 2018. Seidler wants people to know how simple it is to save a life. "It's a no-brainer to take an hour of your time, an hour and a half tops, and you're helping save three people's lives," he said. Seidler has been donating blood and helping organize blood drives since the 1970s. "There are so many great needs in the world for like when the holidays come up, vacations, people go on vacations but that need never ceases. Blood donations don't take a break or a vacation," he said. "I'm just doing what I do right. We're here to help out as an organization and as an individual. We can't just sit there passively and do nothing. Disasters or not there is always a continual need." Every 56 days, Siedler is registered and ready to donate without hesitation. "As long as my body allows me to do that, I think it's actually keeping me in good health doing this so I'm going to keep this going. If they allow you to go to 100 years, doggone it, I'll do it," he said.